Looking for some festive ways to get into the holiday spirit in Louisville KY this year? Louisville is a wonderful place to enjoy the winter months. Take a break from the hustle bustle of holiday shopping and check out some of the enjoyable activities around the community this season. The Galt House Hotel hosts several holiday events each year. Lots of festivities for adults and children alike! For example, there are still a few performances of the Colors of the Season Holiday Dinner Show this month on December 10th, 12th, and 14th. Tickets are $48.95 for adults and $20.95 for children or $38.95 and $13.95 for the matinee show on December 12th. KaLightoscope runs until January 1st and includes a wonderful display of artistic lights, Christmas Village with Snow Fairy Princess, and Candy Cane Forest with Peppermint Express Kiddie Train. You can get one free child's admission with the purchase of an adult admission ticket ($14.99 Monday-Friday or $18.99 Friday-Sunday) and each additional child is $9.99. The Galt House also has a variety of interactive experiences for children and even a few character meals including a Breakfast With Santa on Dec 14th and 21st from 10am to 12 noon. The Louisville Mega Cavern is again transformed this year for Lights Under Louisville. Take a trip out with your family and enjoy a 30-40 minute ride through the cavern for a fantastic light display! Admission is $25.00 per car. Louisville has a vibrant arts community and several of the local groups have holiday performances. Actors Theatre of Louisville will be presenting A Christmas Carol through December 23rd. Tickets range from $32 to $54 a person. Derby Dinner Playhouse (just across the river in Clarksville, IN) is presenting two holiday shows: Winter Wonderettes and Jingle Arrgh the Way! A Christmas Pirate Adventure. Tickets range from $35 to $41 dollars a person. Stage One Family Theatre is again presenting The Best Christmas Pageant Ever (appropriate for kids ages 8 and up) at the Kentucky Center in the Bomhard Theatre on December 14th and 21st. Tickets are $19.75. You can also take in a fantastic performance of The Brown-Forman Nutcracker presented by Louisville Ballet until December 22nd. The Bourbon Trail is great fun throughout the year for locals and also for tourists. Several of the nearby distilleries host holiday events in December. Woodford Reserve Distillery offers a Holiday Lunch through December 29th as well as a Holiday Dinner With Lantern Tour available on Friday and Saturday evenings through December 28th. Candlelight Tours are offered at Maker's Mark Distillery. My Old Kentucky Home in nearby Bardstown Kentucky will again offer Christmas Candlelight Tours complete with period music, refreshments, and holiday decor. Tickets are $7 for adults, $5 for seniors, $3.50 for children ages 6-12, and free for children ages 5 and younger. 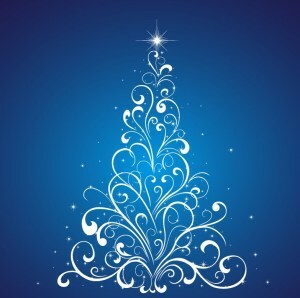 The Kentucky Exposition Center is holding a Christmas Gift & Decor Show December 13th-15th. Check out the displays of home made crafts, candles, food, jewelry and more! Admission is free except for fairgrounds parking. There will also be photos with Santa offered. For more ways to enjoy the culture of Louisville, area information, or details about the Louisville Real Estate market conditions feel free to contact At Home In Louisville Real Estate Group at 502-371-1173. We would love to meet you! 11415 Top Walnut Loop Louisville KY 40229 is a completely move in ready four bedroom home in the Cooper Farms subdivision. The inviting front porch opens to a 2 story Foyer flooded with natural light and with neutral decor. French doors connect the foyer to a room currently used as a private office with crown molding and wainscoting. The space would also make a lovely Formal Living Room. 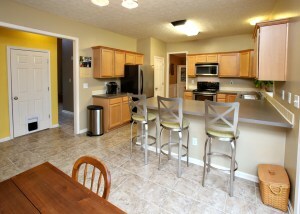 The Kitchen showcases abundant counter and cabinet space as well as a nice dining area that accesses the back deck. The Family Room includes a convenient pass through to the kitchen, attractive lighting fixture, and lots of natural light. 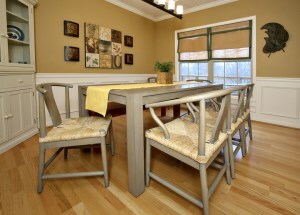 The Formal Dining Room is positioned off of the kitchen and showcases wainscoting and crown molding. A half bath rounds off the first floor. The second floor landing is large enough for a comfortable sitting area and leads to a wonderful Master Bedroom and three secondary bedrooms. The Master showcases a walk in closet and Master Bath with double sink, jacuzzi tub, and walk in shower. The three other bedrooms are good sized and close to a Full Bath and second floor Laundry. 11415 Top Walnut Loop Louisville KY 40229 has a partially finished Basement complete with a Family Room that features a wet bar and recessed lighting. The back yard is fenced and has a great deck with patio below for outdoor entertaining. The home also has a 2 car attached garage. New owners will love the Cooper Farms neighborhood Fitness Room, Clubhouse, and Pool. Call us for your private showing today at 502-371-1173 and let us give you a tour of current Louisville Real Estate for sale. 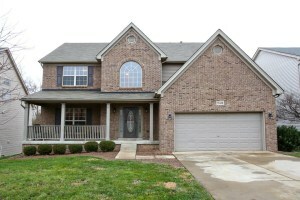 6705 Kings Falls Ct Louisville KY 40229 is a lovely three bedroom, two bath home just minutes from McNeely Lake on a quiet lot in the Park Lake Village subdivision of Louisville Ky. A two story Great Room greets guests with white trim, plush carpet, and neutral walls. The Eat In Kitchen has lots of cabinet space and is connected to the Laundry Room. 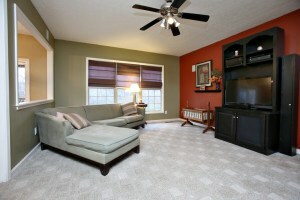 The Master Bedroom is conveniently placed on the first floor with easy access to a Full Bath. The second floor contains 2 Bedrooms and a Full Bath. The grassy back yard and deck are perfect for outdoor entertaining and barbecues! A couple of recent updates include a replacement water heater and crown molding in the upstairs bath. 6705 Kings Falls Ct Louisville KY 40229 sits on a quiet cul-de-sac with sidewalks throughout the neighborhood for walking and biking. Call 502-371-1173 today to set up a private viewing of this fantastic home!